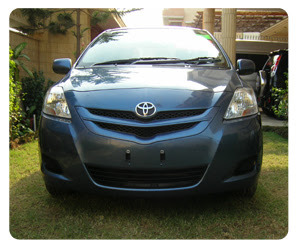 The Toyota Belta (referred to in North American and Australian markets as the Toyota Yaris sedan and in South Asian markets as the Toyota Vios) is a subcompact sedan manufactured by the Toyota Motor Corporation. It is a redesigned and sportier version of the discontinued Toyota Platz sedan. The Belta went on sale in 2006 equipped with 1.0 to 1.3-liter engines (in Japan), and in 2007 in North America equipped with a 1.5-liter I4. The Vitz and the Belta share underpinnings with each other. However, while the Vitz was designed at Toyota's European design studios, the Belta was designed at Toyota's Japanese design studios—design projects for similar cars marketed toward different demographics. While the outgoing Vitz and Platz models look and feel virtually alike (the only things the cars do not share is the front clip, lights, rear doors, and bodies from behind the B-pillar), the new Vitz hatchback and Belta sedans are more subtly related. Sharing a similar but different dashboard, they do not employ the same components. The cars only share a frame and the drivetrain options. The sheetmetal is completely different. The Belta has increased in size over the previous generation, its interior volume larger than the 2001–2008 generation Corolla. The Belta is the only subcompact sedan which is design, built and sold in Japan, and has no direct competitors there, as the Vitz's competitors do not offer the sedan versions. In most Asian countries (with the exception of Japan), the Belta (Vios in South East Asia) is built and assembled in Thailand, while for the Japanese Domestic Market and American market the Belta is built in Japan. This model is not produced in Valenciennes for European, Israeli and Moroccan markets. In an effort to boost sales and gain popularity among youths, Toyota has created a MySpace profile of its North American Yaris/Belta vehicle as part of its advertising campaign.